We all have them, some more than others. Some we rarely see, some that we can expect every year. Some are very poisonous, some are helpful. No matter what type of gardener you are sooner of later they will show up and you will need to deal with them, WEEDS. One of the most common weeds found throughout North America. 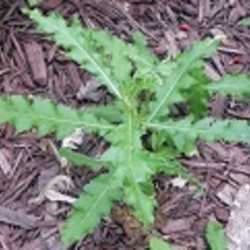 Canada thistle is a deep-rooted perennial, which means it lives for several years. Mowing or pulling of this weed is not effective because it grows again from vegetative buds on the roots. The roots can extend into the ground 10 feet or more, so cultivation in gardens and flower beds will not help to control this weed. In fact, cultivation can even worsen a Canadian thistle problem. A piece only one-half inch long can produce new plants from the countless vegetative buds in the root system. Due to the extensive root system of this plant an herbicide that attacks the roots as well as the foliage is the only effective way to control this weed. The herbicide should contain glyphosate (Roundup or Finale). These products are fairly safe as they break down and pass from the soil rather quickly. Broadleaf plantain is a perennial weed that grows in areas of inconsistent moisture. Leaves are smooth and oval. Leaf blades are large, 3 to 6 inches long, with prominent veins. Roots are fibrous and shallow. 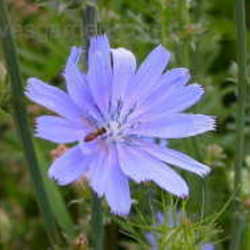 Flowers are produced on stalks, 3 to 6 inches in length. Watch lawns and beds closely; remove young plants before they set seeds. Digging out perennial plantain plants must be done regularly for several years to be successful. Mulching with landscape fabrics can be effective for controlling seedlings. Established plantain can be controlled if the fabric is overlapped and no light is allowed to penetrate to the soil. Use a polypropylene or polyester fabric or black polyethylene (plastic tarp) to block all plant growth. Cover fabric mulches with an organic mulch to improve appearance. Organic mulches may also effectively control plantain seedlings if they are at least 3 inches deep, are coarse enough, and regularly inspected and weeded so they do not serve as a growth medium for new plantain seedlings. For organic mulches, it helps to apply a 6-inch layer initially to account for the gradual degradation that will occur over the growing season. Reapply as necessary. Dandelion is a perennial that grows best in moist areas with full sun; however, it can survive some shade and dry conditions once established. It produces a strong taproot that is capable of penetrating the soil to a depth of 10 to 15 feet, but it is most commonly 6 to 18 inches deep. Buds grow from the uppermost area of the root, producing a crown that can regenerate "new" plants even though the plant is cut off at or below the soil surface. Sections of the root as short as 1 inch in length are also capable of producing new plants. Young plants can easily be hand pulled. Pre-emergent herbicides work well in lawns. Post emergent herbicides that control broadleaf weeds (2, 4-D, triclopyr, MCPA, and mecoprop) can control dandelion seedlings in flower beds. Dandelion leaves are edible and are often used in salads. Just make sure that they are harvested from areas free of herbicides. 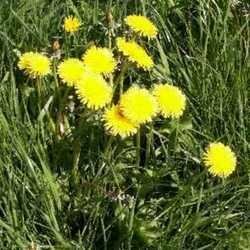 The flowers can be used to make dandelion wine. 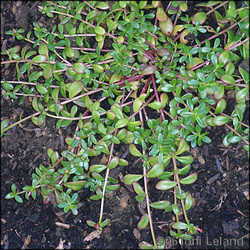 .A hardy perennial, sorrel is most common in the eastern half of North America. Plants spread by seed, and by producing plantlets on shallow roots. 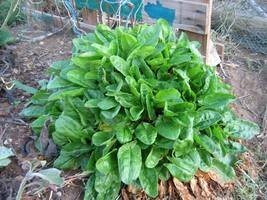 Sorrel is closely related to the salad herb of the same name, but the wild version is often called sheep's sorrel. 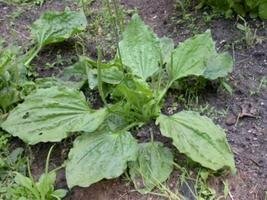 The young, arrowhead-shaped leaves are edible and have a sharp, sour flavor. The least toxic method is hand pulling. This works especially well when the soil is wet. Most weeds reproduce primarily from seeds, and the seeds of some weeds can remain viable when buried in the soil for decades. So it's essential to keep weeds from shedding seeds in the garden. Garden weeds that are neglected until they reach seed-bearing age can be lopped off near the soil line with pruning shears, a stout knife, or a string trimmer with a blade attachment. Cutting back perennial weeds again and again not only reduces reseeding, it also forces the plants to use up food reserves stored in their roots. Pokeweed, also called pokeberry or inkberry, is a member of the pokeweed family. It is a tall, simple perennial herb, growing from a thick, fleshy root. Pokeweed grows from the crown of the thick fleshy root, but reproduces only by seed. Pokeweed is found from Maine to Minnesota and southward to the Gulf of Mexico. The plant is very toxic to both humans and animals except for birds that eat the berries and scatter the seeds over wide areas. 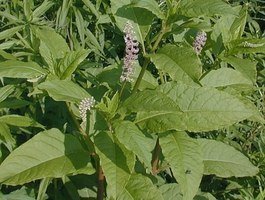 Because of the danger of human poisoning, pokeweed should be eradicated when discovered. This is especially true if the plants are in hedges, gardens, and other areas adjacent to a home where children may be attracted by clusters of berries. If only a few plants occur in an area, pull them up by the roots and destroy them by burning. If the area is large, use an herbicide like Roundup or Finale. Jimsonweed is an annual herb which grows up to 5 feet tall. It has a pale green stem with spreading branches. Leaves are green or purplish in coloration. Flowers are white or purple with a 5-pointed corolla up to four inches long and set on short stalks in the axils of branches. Seeds are contained in a hard, spiny capsule, about 2 inches in diameter, which splits lengthwise into four parts when ripe. All parts of this plant are poisonous. 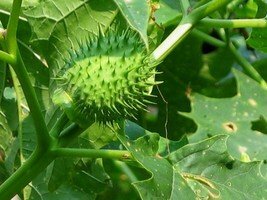 Jimson weed is found throughout the United States and most of Canada. An application of herbicide is recommended as soon this plant is discovered. Due to the toxic nature of this plant be on the lookout for the plants reemergence. Ragweed can be either an annual or perennial depending on the species and region. It is found throughout most of North America. Each plant is reputed to be able to produce about a billion grains of pollen over a season, and is wind-pollinated It is highly allergenic, generally considered the greatest allergen of all pollens, and the prime cause of hay fever in North America. 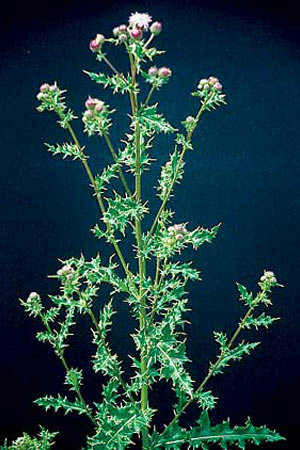 Total removal of ragweed is considered impossible, owing to the plant's frugality and tremendous seed-producing capability. As of 2005, there is no known safe biological control to be used against ragweed in the open. One efficient method for large-scale ragweed extermination is chemical spraying. 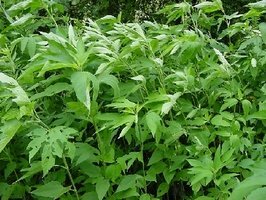 Because ragweed only reacts to some of the more aggressive herbicides, it is highly recommended to consult professionals when deciding on dosage and methodology, especially near urban areas. This is what I classify as a “good weed”.Common milkweed is a perennial growing from a rhizome. The stem is very hairy and all parts of the plants produce white latex when broken. Monarch butterflies lay their eggs on this plant and the larva feed on it. Encourage this plant to grow in your gardens, the butterflies will thank you. Preemergence herbicides do not control ground ivy; accordingly, we are left with post emergence controls. The most effective control comes with the use of combination herbicides that contain the product dicamba. The best time to achieve good control is in the fall, from mid-September to early November. 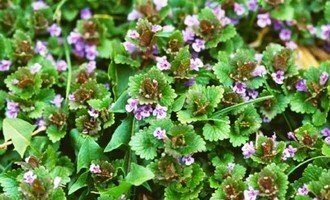 The next best time to control ground ivy is when it is just beginning to flower. Two herbicide applications, spaced 10 to 14 days apart are usually necessary to achieve good control. Ground ivy, though difficult, can be successfully removed. Once you've gone through the work of eliminating it, good mowing, fertilization, and cultural practices will help keep it out of the lawn. In flower and vegetable gardens, keep a plant-free zone at the edge of the garden to allow for easy control of invasive weeds before they spread into desirable plantings. In my opinion this is one of the most invasive weeds in the United States. I’ve seen it run for 30-40 feet under landscape fabric and mulch to emerge to the sunlight. In urban areas it gets started in areas such as schoolyards and parks where maintenance is usually minimal. Once it gets a foothold it is extremely hard to kill. Field bindweed is a deep-rooted perennial weed that is well adapted to most of North America. It is a native of Europe and western Asia and was introduced to this country during colonial days. 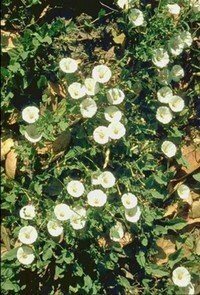 Bindweed is found across the United States, except in a few southwestern states. Bindweed can be spread by seed, root fragments, implements, infested soil adhering to the roots of nursery stock, root growth from infested areas, and by animals. This weed has a deep root system that competes with desirable plants for water and nutrients. Vines climb on plants and shade the plant hindering growth. Established bindweed is difficult to control. An effective control program should prevent seed production, kill roots and root buds, and prevent infestation by seedlings. This plant is very persistent and a successful control program must be more persistent. The best control of field bindweed is obtained with a combination of cultivation, selective herbicides, and competitive crops. Intensive cultivation that controls newly emerged seedlings, may kill young bindweed infestations, and contributes to control of established stands. Timely cultivations deplete the root reserves of established plants and stimulate dormant seeds to germinate. Bindweed can be controlled when tilled eight to 12 days after each emergence throughout the growing season. During control experiments in the Midwest 16 to 18 tillage operations over more than two years, at two- to three-week intervals were needed to eliminate established stands of bindweed. . Long-term control of bindweed from herbicides depends on movement of a sufficient amount of herbicide through the root system to kill the roots and root buds. This requires use of systemic (movement throughout the plant) herbicides. Examples of systemic herbicides include 2,4-D, dicamba (Banvel/Clarity), picloram (Tordon), and glyphosate (Roundup or equivalent). For successful control, herbicides should be applied when bindweed is actively growing and stems are at least 12 inches long. Plants growing under moisture or heat stress usually have smaller leaves with a thicker cuticle and slower biological processes than plants growing in more favorable conditions. As plant stress increases, herbicide uptake and translocation decreases, which in turn decreases herbicide performance. Weeds: A Curse To All Gardeners Friend or Foe? Weed Identification Don't Kill Those Weeds!! !